Dr. Brotherton grew up in the East End of London, England where he worked in various blue-collar jobs while organizing labor and youth. He came to the United States in the 1980’s, working toward his Ph.D. degree at the University of California, Santa Barbara while teaching public high school in San Francisco. Dr. Brotherton gained his doctorate in Sociology in 1992 and began work on street gang subcultures at U.C. Berkeley in the same year. In 1994, Dr. Brotherton came to John Jay College of Criminal Justice where he continued his research and teaching on youth resistance, marginalization, and deportation co-founding the Street Organization Project in 1997. He has received numerous research grants from both private and public agencies and has published widely in journals, books, newspapers and magazines. In 2003 and 2004 Dr. Brotherton co-organized the first academic conferences on deportation in the Caribbean and the United States respectively. He received the Praxis award for contributions to social justice from the Critical Criminology Section of the American Society of Criminology in 2015, named Critical Criminologist of the Year in 2011 and won the Choices award for "Keeping Out the Other" in 2008. He has also been nominated for the 2011 George Orwell Prize in England and the C.Wright Mills Award in the United States. Among his recent books are: Immigration Policy in the Age of Punishment: Detention, Deportation and Border Control with Phil Kretsedemas (New York: Columbia 2017); Las Pandillas Como Movimiento Social with Luis Barrios (University of Central America Press 2016); Youth Street Gangs: A Critical Appraisal (Routledge 2015); Banished to the Homeland: Dominican Deportees and Their Stories of Exile, with Luis Barrios (Columbia 2011); Keeping Out The Other: A Critical Introduction to Immigration Control, edited with P. Kretsedemas (Columbia 2009); and The Almighty Latin King and Queen Nation: Street Politics and the Transformation of a New York City Gang, with Luis Barrios (Columbia 2004). Dr. Brotherton is the former chair of the Dept. of Sociology at John Jay College and the Director of the Social Change and Transgressive Studies Project (http://social change.org) He is also the founding editor of the "Studies in Transgression" book series at Temple University Press. His current research projects include an evaluation study of the Credibe Messengers and Mentors Initiative at the Department of Youth and Rehabilitation Services in Washington D.C., a criminological investigation of citizenship security in Ecuador funded by the Guggenheim Foundation, a collaborative critical ethnographic study of immigration removal in New York City called the Social Anatomy of the Deportation Regime and with Rafa Gude is completing the International Handbook of Critical Gang Studies to be published by Routledge in 2020. Brotherton, D. (editor and contributor) and P. Kretsedemas. 2017. . New York: Columbia University Press. 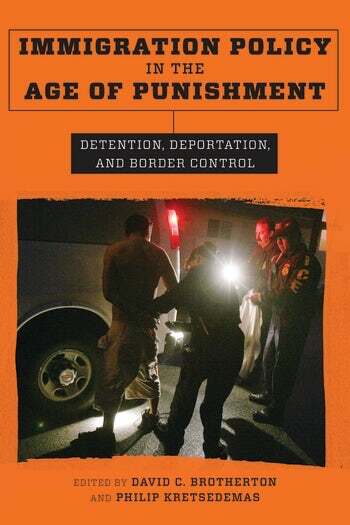 Immigration Policy in the Age of Punishment: Detention, Deportation, Border Control. Brotherton, D. and L. Barrios. 2017 (2nd edition). Las Pandillas Como Movimiento Social: La Historia de los King y Queens Latinos de Nueva York. Quito: Centro de Publicaciones de la PUCE (Ecuador). Brotherton, D. and L. Barrios. 2016 (1st edition). .Las Pandillas Como Movimiento Socia: La Historica de los Kings y Queens Latinos de Nueva York. San Salvador (El Salvador), University of Central America Press. (Spanish translation). Brotherton, D. (eds), D. Stageman and S. Leyro. 2013.Outside Justice: Criminalizing the Immigrant and the Criminal Justice System. New York: Springer. Brotherton, D. and L. Barrios. 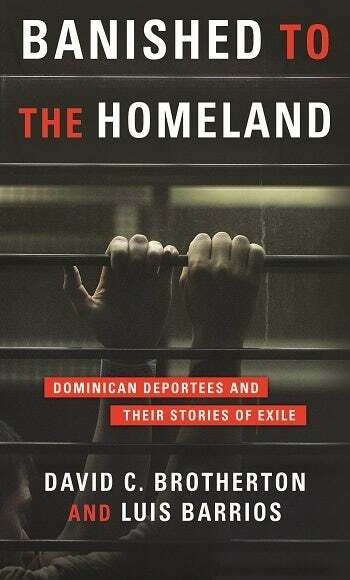 2011.Banished to the Homeland: Dominican Deportees and Their Stories of Exile. New York: Columbia University Press. (Nominated for C. Wright Mills Award [ASA], Hindelang Award [ASC] and George Orwell Prize. 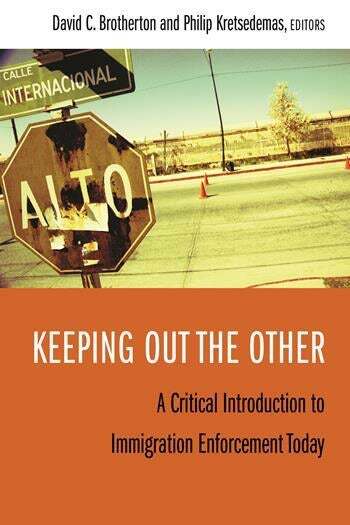 Reviewed in Contemporary Sociology, Choices, Journal of Latin American Studies). Resistance. New York: Columbia University Press. (Reviewed in International Criminal Justice Review; International Social Work). Brotherton, D. and L. Barrios. 2004.The Almighty Latin King and Queen Nation: Street Politics and the Transformation of aNew York Gang. New York: Columbia University Press. (Reviewed in Theoretical Criminology, Latino Studies, Chronicle of Higher Education, Social Work Today, Youth Today, Choices, Sociology and Social Welfare, Socialism and Democracy). S. Will, S. Handelman and D. Brotherton (editors). 2012.“How They Got Away With It: White-Collar Crime and the Financial Meltdown,” New York: Columbia University Press. (Reviewed in Kirkus Reviews, Irish Times, Contemporary Sociology). Kontos, L., D. Brotherton (editor and contributor) and L. Barrios 2003.Gangs and Society: Alternative Perspectives. New York: Columbia University Press. (Reviewed in Contemporary Sociology, Sociology and Social Welfare, Choices, City Limits). Brotherton, D. 2017. Social Banishment of the U.S. Criminal Alien: Norms of Violence and Repression in the Deportation Regime. L'Annee Sociologique, 68(1), 185-210. “Jock Young and the Criminological Imagination as a Life Force,” Journal of Crime, Media, Culture. 10(2): 227-237. “The Latin Kings and the Global Process: An Extended Case Study Analysis,” Journal of Studi Sulla Questione Criminale (translated into English, Spanish and Italian). 4(1): 7-46. “Beyond Social Reproduction: Bringing Resistance Back Into the Theory of Gangs,” Theoretical Criminology. Vol. 12, No. 1, 55-77. Education/Pedagogy/Cultural Studies, 24(4), pp. 305-333, Oct-Dec.
Special Edition of same journal vol 28(1)]. "Socially Constructing The Nomads: Part One," Humanity and Society, pp. 1-21 (June). "The Contradictions of Suppression: Notes from a Study of Approaches to Gangs in Three Public High Schools (Lead article)," Urban Review, 28(2), pp. 95-120. (Also selected for Rutgers University Special Collection on Criminal Justice). "Smartness, Toughness and Autonomy: Drug Use in the Contexts of Gang FemaleDelinquency," Journal of Drug Issues, 26(1), pp. 261-277. (Reprinted in In Her Own Words: Women Offenders' Views on Crime and Victimization An Anthology Edited by Leanne F. Alarid and P. Cromwell. London: Oxford University Press]. Brotherton, D. and L. Naegler. 2014. “Social Bulimia: Crime and the Contradictions of Capitalism.” Theoretical Criminology. 18(4): 441-449. Brotherton, D. and J. Young. 2014. “A Cultural Criminology and its Practices: A dialogue between the Theorist and the Street Researcher,” Dialectical Anthropology, (32)2:117-132. Brotherton, D. and Y. Martin. 2009. “The War on Drugs and the Dominican Deportee,” Journal of Crime and Justice, (32)2: 21-48. Brotherton, D. and L. Barrios. 2009. Hess, M. and D. Brotherton (under review). “Counter-Terrorism, Dangerous Knowledge and the Ethnographic Intervention” submitted to Journal of Crime, Media, Culture. Rostami, A., F. Leinfelt and D. Brotherton. 2013. “Understanding Gang Leaders: Characteristics and Typologies.” Free Inquiry in Creative Sociology. 1(2):1-25. Brotherto, D. 2018. "Studying the Gang Through Critical Ethnography,"Oxford Handbook of Criminal Justice and Ethnography edited by S. Bucerius and K. Haggerty. New York: Odford University Press. Brotherton, D. 2017. "Critical Gang Studies," in Oxford Research Encyclopedia of Criminal Justice and Criminolgy edited by H. Pontell and J. Miller. London: Oxford University Press. “Youth Groupings, Riots and Discrimination,” in European Youth Studies Compendium. Edited by C. Feixa. Barcelona, Anthropos. 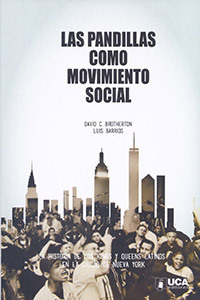 “The Criminalization of Zucotti Park and Lessons from the UK Riots,” in “Riots and Social Movements” in Social Movements in the Neo-Liberal Era edited by David Pritchard and Frances May. London: Palgrave, pp. 285-295. “The Theater of Cruelty and the Permanent Exile of Immigrants” in The Criminalization of Immigration: Contexts and Consequences edited by Alissa Ackerman and Rich Furman. Carolina Academic Press. Pp.31-49. “The Social Bulimia of Forced Repatriation: A Case Study of Dominican Deportees” in The Borders of Punishment: Criminal Justice, Citizenship and Social Exclusion edited by Katje Frank Aas and Mary Bosworth. Oxford: Oxford University Press, pp.201-217. “Social Constructionism and the Gang” in The Gang Manual edited by Amir Rostami. Stockholm: University of Stockholm Press, pp. 65-82. “Richard Cloward (1926-2001)” in Fifty Key Thinkers in Criminology edited by K. Hayward, S. Maruna and J. Mooney. Routledge: New York, pp 147-152. “La Globalización de los Latin Kings: Criminologia Cultural y Los Latin Kings” in Otras Naciones: Transnacionalismo, Jovenes y Exclusion edited by L. Barrios and M. Cerbino. Quito: Flacsco Publications, pp. 27-40. 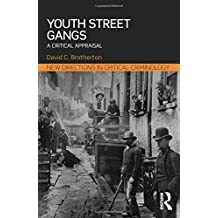 “Introduction” and “Youth Resistance and the Street Organization in Late Modern New York” in D. Brotherton and M. Flynn (editors) Globalizing the Streets: Cross-Cultural Perspectives on Youth, Marginalization and Resistance, New York: Columbia University Press. Era edited by P. Kretsedemas and D. Brotherton. New York: Columbia University Press. “Towards the Gang as a Social Movement,” in Gangs in the Global City, edited by J.Hagedorn. Chicago: University of Illinois Press. “What Happened to the Pathological Gang: Issues and Findings from a Case Study of the Latin Kings and Queens of New York,” in Cultural Criminology Unleashed, edited by J.Ferrell, K. Hayward, W. Morrison and M. Presdee. London: Cavendish. 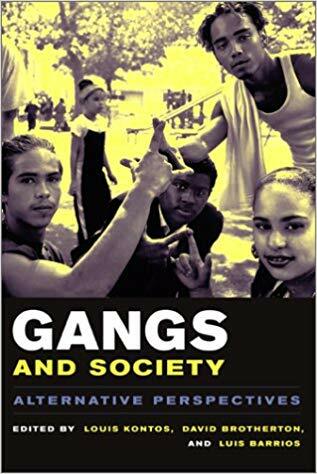 “The Role of Education in the Reform of Street Organizations in New York City” in L.Kontos, D. Brotherton and L. Barrios (editors), pp.136-157, “Gangs and Society: Alternative Perspectives,” New York: Columbia University Press. Brotherton, D. and S. Tosh. 2018. "Immigration and Deportation Enforcement," in Oxford Encyclopedia of Criminal Justice and Criminology edited by H. Pontell and J. Miller. London: Oxford University Press. Brotherton, D. and S. Tosh. 2017. "The Sociology of Vindictiveness and the Deportee," Immigration Policy in the Age of Punishment edited by D. Brotherton and P. Kretsedemas. New York: Columbia. Brotherton, D. and C. Salazar. 2003. “Pushes and Pulls in the Resistance Trajectories of the Latin Queens,” in L. Kontos, D. Brotherton and L. Barrios (editors), pp.183-209, “Gangs and Society: Alternative Perspectives,” New York: Columbia University Press. Brotherton, D. 2001 (revised 2nd edition), 1998 (1st edition). "From Gangs to Street Organizations: The Changing Characteristics of Street Subcultures in New York City," Crime and Justice in New York City, edited by A. Karmen. New York: McGraw Hill. Perspectives on Social Problems, vol 5, pp. 147-171, 1994, edited by J. Holstein and G.
Daza, Anna, D. Brotherton, and G. Escobar 2008. Globalizing the Streets: Cross-Cultural Perspectives on Youth, Marginalization and Resistance, New York: Columbia University Press. Hart, S. and D. Brotherton. 2003. 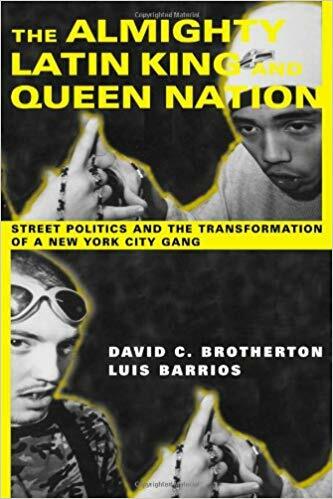 “Snapshots from a Movement: The Almighty Latin King and Queen Nation 1997-1999,” in L. Kontos, D. Brotherton and L. Barrios (editors), 2002, pp.314-336, “Gangs and Society: Alternative Perspectives,” New York: Columbia University Press. Barrios, Luis, Marcia Esparza y David C. Brotherton. 2006.
by Carles Feixa. Barcelona: Anthropos. Ocejo, R. and D. Brotherton, 2009. “Night Time Economy in New York City” in Nightlife and crime: social order and governance in international perspective edited by P. Hadfield. New York: Oxford University Press 2009. “Latino Deportations” in Oxford Encyclopedia of Latino/as in Contemporary Politics, Law, and Social Movements edited by S. Oboler and D. Garcia. New York: Oxford University Press. “The Criminology of Richard Cloward” in Encyclopedia of Criminology and Criminal Justice edited by J. Albanese and M. Dodge. London: Wiley. “The Latin Kings” in Encyclopedia of Crime, Edited by Jeffrey Ian Ross. Sage Publications. “The Asociación Ñeta” in The Encyclopedia of Gangs edited by D. Brotherton and L.
“Anti-Gang Police Repression,” in Encyclopedia of Criminal Justice edited by L.
Sullivan. Thousand Oaks, Calif.: Sage. The Dominican Deportation Project is an ongoing study of pre- and post-deportation experiences of Dominican "deportable aliens" through the lens of critical sociology and criminology. This project started in 2002 and is one of the longest studies of the historical causes, social processes and multivalent effects of deportation on a sub-population in the U.S. and the Caribbean. The first inter-disciplinary case study research into the organization, practices and consequences of a deportation regime in a major U.S. city. A multi-year study in Ecuador of the only street gang legalization policy to be implemented by a national government and how it relates to the most sustained drop in homicide in the world. A 3-year evaluation of the most far-reaching implementation of a credible messenger mentorship program in which formerly incarcerated members of the community along with other longstanding community members are recruited into a specially designed holistic initiative to help committed and post-committed youth successfully complete their jounrey of rehabilitation.